U.S. President Barack Obama on Wednesday told a group of young people gathered in Laos from across Southeast Asia that it is not enough to dream about their plans for the future, but that they have to "actually do the work." In an upbeat town hall event with people involved in the U.S.-sponsored Young Southeast Asian Leaders Initiative, Obama said young people have historically been the key to progress and development. He stressed the need for countries to improve education standards and to make sure those gains include girls and not just boys. "You should never be discouraged, because you have more opportunity today to make a difference in the world than any generation before," he said. "And my hope is you seize that opportunity." In response to questions from the audience, Obama said he hopes the next U.S. leader will continue his increased engagement with the Asia Pacific region and that he believes Congress will pass the Trans-Pacific Partnership trade deal. He also touted the benefits of interacting with people of different cultures as a way to continually learn, and highlighted the need to respect people who have different beliefs and backgrounds. "I think that over the long term the only way that humans are going to be able to work together and interact and prosper and deal with big problems is if we are able to see what we have in common with each other and treat each other with dignity and respect," Obama said. The president told the audience he plans to continue working with young people after he leaves office in January. Obama is in Laos to meet with ASEAN leaders and give reassurances that the U.S. strategic rebalance toward Asia is a long term strategy. Earlier Wednesday, Obama said the United States has a "profound moral and humanitarian obligation" to support efforts to clear bombs its forces dropped on Laos during the Vietnam War. ​Eighty million cluster munitions did not explode, instead settling on farmland and around villages, only to later kill or injure 20,000 people. 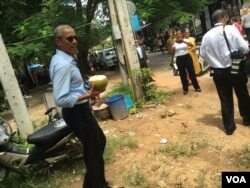 Obama spoke of that legacy as he visited a center in Vientiane called the Cooperative Orthotic and Prosthetic Enterprise that offers treatment for survivors. "Here in Laos, here at COPE, we see the victims of bombs that were dropped because of decisions made half a century ago and we are reminded that wars always carry tremendous costs, many of them unintended," he said. Obama stressed that wars impact countless people beyond the famous who appear in history books. "Above all, acknowledging the history of war and how it's experienced concretely by ordinary people is a way that we make future wars less likely." His comments came a day after announcing a doubling of U.S. funding over the next three years to help the survivors and bomb-clearing efforts. 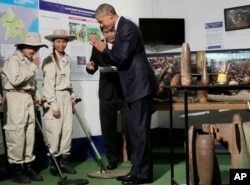 U.S. President Barack Obama greets workers in a tour displaying tools used to clear land of unexploded ordnance at the Cooperative Orthotic and Prosthetic Enterprise (COPE) Visitor Centre in Vientiane, Laos, Wednesday, Sept. 7, 2016. The funding is part of what the White House called a new era in relations based on "a shared desire to heal the wounds of the past" and build a foundation for the future. The U.S. and Laos are also partnering on issues including the economy, technology, education, security, the environment and human rights. Obama is the first sitting U.S. president to go to Laos. The visit marks his eleventh and final trip to Asia as U.S. president.